00:07 AlexYst I was trying to create an underground farm, but it's just not feasible. To make it work, there needs to be a mese lamp or mese lamppost directly above each plant. There's no room to walk if I do that. 00:08 AlexYst I was hoping to maximise the efficiency of my underground highway's space, but it looks like that's not going to happen. 00:19 AlexYst Hmm. It looks like there's space to walk between adjacently-placed lampposts, on further inspection. 00:19 AlexYst It's not entirely comfortable, but it'll work. 00:20 AlexYst Now I just need to worry about whether I can gather enough mese to build that many lampposts. 00:33 AlexYst It looks like I'd need to gather 194 mese crystals from every 16^3 area I clear out. One in every 21 nodes would need to be a mese ore. I don't think mese is that densely-packed. I need to come up with a new plan. 00:34 AlexYst Maybe I should just leave the farm out of my highway plans altogether. 00:52 AlexYst That'd be lovely. Underground farms would be so much more feasible. 00:54 AlexYst The catch is that the soil'd need to glow at LIGHT_MAX or LIGHT_MAX-1. Anything dimmer and it won't keep the crops growing. I'm not sure the Minetest Game developers want a soil that bright. 00:55 AlexYst Hmm ... I wonder though ... Maybe once I find the time to complete my current mod, I'll set up a glowing soil mod that adds nodes like you described. If someone doesn't beat me to it. 00:59 AlexYst Hmm. That gives me an unrelated idea for some reason. Maybe crops could be added for growing minerals, based on the mineral mixed with the soil and/or seed. 01:00 AlexYst Mese cotton might produce mese crystal fragments, for example. 01:00 AlexYst Nah. I won't do that. 01:00 AlexYst Have you seen the mineral trees mod? 01:01 AlexYst I forget what it's called. 01:01 XeonSquared I haven't. Not played much Minetest recently. 01:01 AlexYst My mineral crops would be a bad knockoff of that, now that I think about it. 01:01 AlexYst It makes it so minerals spawn in freshly-generated trees sometimes. 01:02 AlexYst But if you mine them and put those tree/mineral nodes near water, they grow a continuous stream of that mineral. 01:02 AlexYst It's like farming, but without the need to keep replanting. 01:03 AlexYst Yeah. It's an old mod, but I don't see anyone using it. 01:03 AlexYst I came across it when I was trying to find mods to test their compatibility with my main mod. 01:04 AlexYst I found all sorts of incompatibilities in different mods, so I was able to fix those issues. 01:04 AlexYst That mod worked right off the bat though. 09:20 deltasquared given that it's only a 2D vector. 09:27 deltasquared sfan5: oh boy, core code time. 09:28 deltasquared sfan5: huh, but the visual size there has 3 components in the vector? does that mean the lua API docs on the site are incorrect? 09:30 deltasquared I guess it doesn't make much sense to have x and z be independent considering rotation etc. 10:12 deltasquared alright, I'm back again. 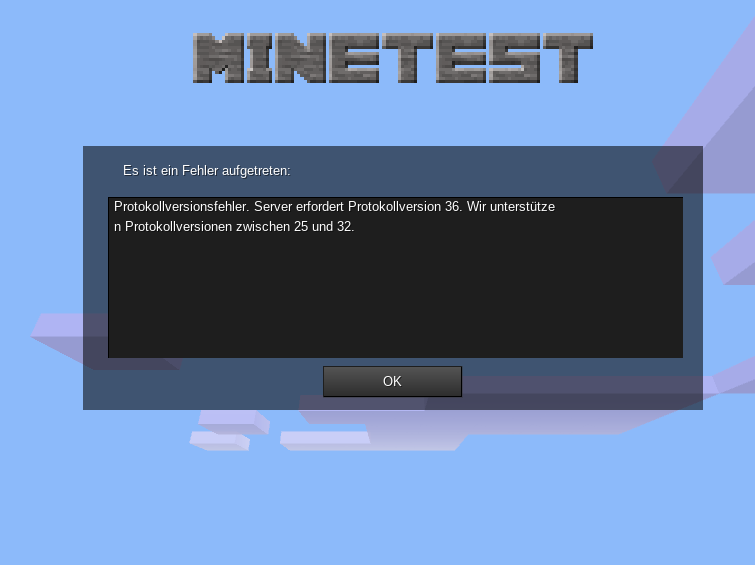 does minetest have any facility by which one could test out lua fragments which use the mod API in-game? 10:12 deltasquared like, just being able to open a console and type something like "get_current_player().<insert playerref method here>()"
10:14 deltasquared sfan5: oh, naturally. cheers. 10:18 deltasquared git troubles again? 10:21 deltasquared welp, decided to call set_physics_override() to see what happens, now I can't move, welp. 10:22 deltasquared I should probably read the layman's shortlog for the upcoming version on the wiki. 11:03 deltasquared sfan5: right, so I'm not aware of what it looks like internally - is it just a case that the engine doesn't take this set collision box into account when determining movement around nodes? 11:03 sfan5 are you using 0.4.16? 11:04 deltasquared arch linux's packages are still on 0.4.16. 11:09 deltasquared ... does run-in-place mode even work if built on linux? 11:09 sfan5 why wouldn't it? 11:10 Chinchou Anyway, it works fine - I use run_in_place on my Devuan and debian boxes, makes things nice and easy. 11:11 Chinchou In my case, it keeps my scripts from breaking. 11:11 Chinchou Write once, keep 'em in the build directory. 11:12 deltasquared might I suggest by the way, edits to some of the API pages so say the code examples have comments such as "in development version"
11:12 deltasquared inb4 "why don't you do it"
11:12 sfan5 api pages = dev.minetest.net? 11:13 deltasquared oh, 'course. right. I guess I'll just clone the repository already. 11:20 * Chinchou sees cmake, sneezes. 11:20 Chinchou I think that almost anyone who tries using it will end up being allergic to it. 11:21 deltasquared Chinchou: I looked at an example once and almost immediately saw macro usage, and was like "this is going to go well..."
11:21 Chinchou for configuring, not for developing, I mean. 11:23 Chinchou Pff. Anyway, 'tis a nice UI to cmake. 11:30 deltasquared to actually run it after it's built, could I run it directly from the build output directory? 13:03 deltasquared so you had to undo the release commit to amend the fix? 13:04 deltasquared ok, so this time I'm going to use the api doc in the repository. 13:05 deltasquared I kinda wish it weren't in one big lump though. 14:19 Brackston How is the technic:common_tree_grindings made? The grinder(s) do not produce it from wood planks or logs. Am I missing something in a seetting to make this happen? 14:45 Brackston Hi DS-minetest, I have the default:tree and place it into either grinder (LV of MV), and nothing happens. the grinders both process ores fine. 15:16 Brackston I am going to try the rubber tree and see if that functions. 15:22 Brackston Acacia and rubber trees grind, default:tree and default:wood do not grind. 15:24 rdococ woof! woof woof. woof ? !? woof 1! 17:04 sofar why not post it in french too? or in german? 17:07 luizrpgluiz sofar: I put it in English and within the relatives in my native language, because if I put it in English only, the staff will be a bit confused by the mistakes of English that I do without meaning to. 17:09 luizrpgluiz sofar: I put it without translation into English on the topic of discussions in other languages in the Portuguese part. 17:12 jas_ anybody ever notice the player's movement being quantized ever so slightly every so often, just a little, while jumping forwards diagonally? i've noticed it for a while now but never brought it up and was curious.